DEBKAfile Exclusive: On July 2, Iran’s supreme leader Ayatollah Ali Khamenei initiated secret inquiries into the Trump administration’s conditions for negotiating a new nuclear deal. Our exclusive sources report he was driven to look for an escape from the tough US sanctions clamped down on Iran, after his advisers warned him that the full weight of those penalties scheduled to fall in August, plus a US ban on Iran’s oil exports in November, would bring the Tehran regime to breaking-point. On Sunday, July 29, Foreign Minister Muhammed Javad Zarif boasted: “We have enough power to show the United States that it should abandon this addiction. We believe that the world has come to the conclusion that the US should overcome its dependence on sanctions.” The timing of Zarif’s words was telling. They were meant for the ears of US Defense Secretary James Mattis, who that day was receiving at the Pentagon the Omani Foreign Minister Yusuf bin Alawi bin Abdullah. According to Oman sources what they discussed was how to de-escalate tensions between the US and Iran. 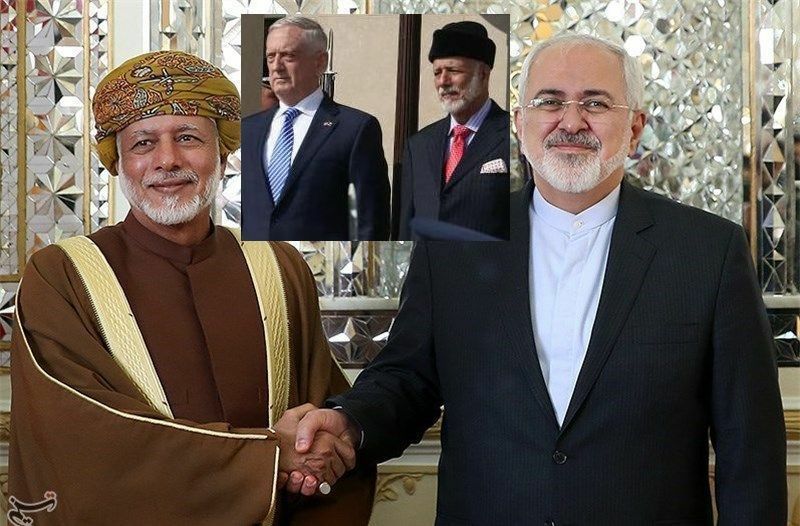 The Omani minister had previously met with Zarif on July 2 and was able to report to Mattis that the Iranian minister had asked Oman, at Khamenei’s behest, to undertake the role of go-between with Washington. It may be recalled that, during 2012-2015, the Omanis performed on behalf of the Obama administration this same secret diplomatic mission. It led to the signing of Iran’s 2015 nuclear accord with six world powers. Last May, President Donald Trump ditched that accord as “the worst deal every made.” But according to DEBKAfile’s sources, Trump last week gave Mattis the green light to ask the Omani foreign minister to reopen an indirect channel to Tehran, thus repeating the secret diplomacy pattern used by his predecessor for dealing with the Islamic Republic. The exploratory steps in motion for a fresh round of nuclear negotiations between the US and Iran will be uncovered in the coming issue of DEBKA Weekly out next Friday, Aug. 3, along with its wide-ranging significance for the Middle East and Gulf regions. If your are not yet on the list of subscribers to his unique publication, click here. …and later get them to hand over the nations wealth back that they stole or they’ll lose more than that.. Yes, Frank – these filthy islamic indoctrinated parasite murderers should be hanging – like ALL THOSE they have done the same thing to. Hang them! … and hand them over to the US and its lackeys? Looks like the Iranian Liars have just Blink to Save their Life of Luxury! The Lions of Persia needs a Return of Persian King Cyrus Society & Culture Of Enlightenment! Ok, that was the so called Trump administration….now our only and only hope is mr Natanyahou, to free iranian people. We do not forget what Carter did with our Shah….. I so hope you guys can get rid of these bastards. It will need to come from you guys as there’s too many that play international power politics – ALWAYS at the ordinary people’s expense. Norbus – great comment. They are thieving murdering bastards – stole from their people. Yes I agree totaly, but someone must stop the oil export of iranian people so that sepahs economy collapse then , when there will be a shortage of everything in Iran people will automaticly come out to streets. But mullahs should not be able to get money from oil exports! POTUS Trump with No Foreign-Policy Experience whatsoever has proven Speaking Honestly and Retorting against threats with Vigor and Fortitude has the World to taking him seriously. POTUS Trump has made Deadbeat Europe Nations ante up on NATO, seeking less to no Tariffs that is improving Trade Seals, and standing up to North Korea, Iran, and Cuba, while pushing back against Chinese Theft of Intellectual Property, Exposing Anti-Semitics, Fecklessness Human Rights in the UN, ignoring Palestinians that refuse to Talk True Peace, by finally moving the American Embassy recognizing Jerusalem as Israel Capital fulfilling the Promise and legislation by other Presidents, Senate and Congress. POTUS GHW Bush refused to unseat Sandam Hussein after his Invasion of Kuwait and Poison Gas of Kurds. Shiia, and Sunni Opposition. POTUS Clinton gave away Billions in Aid to placate North Korea that only used it to build a Nuclear Bomb. POTUS GW Bush mishandled and misspent the Invasions of Afghanistan and Iraq never finding Osama bin Laden. POTUS Barack Obama pursued a bizarre Iran Policy, from the first days of his administration, when he went on Iranian television blaming America while Mullahs shouted “Death to America”? All the while allowing Iran to Export Terrorism in its Feeble Attempt become a Middle East Regional Power, with America supplying Pallets of Cash close to $100 billion in Exchange for Broken Promises that Iran cheated and revoked at will. Iran’s Ayatollahs, Mullahs, Clerics and Generals all Huff and Puff and tried to Blow away POTUS Trump’s with Blustering Threats and Promises of Phony Wars if Trump withdrew from the Weak Foolish Obama Iran Aid Agreement. POTUS Trump Middle East Policy First Steps was rallying a Natural Coalition of Sunni Gulf States with Israel to reign in and keep a Check Iran’s Regime, Yemen’s Houthi, Gaza’s Hamas, West Bank Fatah and Lebanon Hezbollah, Syrian use of Gas Attacks and even Russia’s Ambitions in the Region. Even Europe has been neutralized, impotent and now must isolate itself from Iran as well. The Iranian Regime has ruined the the Iran Rial Currency hitting a Record Low of 100,000 Rials to One US Dollar amid a Deepening Economic Crisis and that is before the August Imminent Return of Sanctions, and November Fully implemented Worldwide Sanctions. The simple Fact remains no one in the World will take Iranian Rials nor can any International Business Transaction be made that can’t be Insured so Iran has to cut a New Deal. The Iranian Rials are not near Venezuela Own Self-Inflicted Depreciated Depression , but it is getting there. The Eial has lost half its value in just 4 months. Meanwhile POTUS Trump Policies and Americans are working and rebuilding an American Military, Navy and Space Force that has China and Russia gushing with Envy and Fear. While Iran Robber’s Regime attempts to fix the Rial Rate at 42,000 Failed and their Revolutionary Guards tried to crack down on Iran’s Black Market Traders was met with Beating and causing them to Retreat in cities all over Iran. Funny thing about Iranian Robes Regimes Living in Luxury are now worried and trembling about a Prolonged Economic Downturn with no safe way or place to store their Investments and Savings, meaning Persians with Cash are getting organize against the overthrowing the Robes Regime. President Hassan Rouhani had to take action to replace Central Bank Chief, Valiollah Seif which is another show of weakness by shuffling the Head Central Banker making zero difference. All these POTUS Trump Policies, Foreign Relations, and American Financial, Military and Trade Might is causing Iran’s Financial Crisis of Currency Collapse until Iran stops its Atomic Program forcing Iran’s current problems more anticipatory but with no answers to solve it. All within18 Months of POTUS Trump Administration. The Longer Iran’s Robe’s Regime waits the easier it will be to cause Iran Regime Change and Transformation into Greater Persia Period of Middle East Renaissance. While Hezbollah, Hamas, Hounti, and Fatah all will wither away as well, or sent away, or buried by their own choosing. Ginger, yet another tirade with a lot of assertions and no backup, what is it going to take for you to start providing some references for the claims you’re making about events inside of Iran. I see so much from you and you state everything so confidently like it’s fact, but with no references it’s hard to take what you’re saying as truth. @Seeker of Truth Jul 31, 2018 @ 1:42 at 1:42………I have no problem with you pointing out with specifics any portion of my Posts and make any Corrections with your own Facts, Sources, to back up your Opinions as well, anytime. However, from you Postings of 4 Lines, I and Others can see you have said nothing, to back up your own complaints about details within my Posts, and the only Facts you provided is the one you proved, showed, and so far have provided Zero! I’ll await your Rebuttals and if you are capable and do so, I am more than Happy to Acknowledge them and any Corrections as well as Thank You for Educating me is such Discussions. Until then, if you are unhappy with my Words explain to everyone which ones and why and use your own Sources but so far you did not do that have you? You saying I have a Tirade and Assertions with No Back Up of your own is what you just did, did you not? We await your wisdom but it can’t be just your opinions!!! Moreover, We can share and learn together. Ginger they did not break any promises at will. I agree with the Seeker of Truth. You are full of crap and you must be about 20 years old at the most. You are free to disagree anytime and I accept it, but Iran was caught cheating on the Agreement as the Iran Documents show and it is still and always has been a Regime of Exporting Terror and Subjugates its own Persian People, if you want to defend them, and can provide sources, citations, and facts to argue otherwise, by all means do it, and so be it! So far you and Truth Seekers did neither! The secret deal only allows the ayatollahs to keep chickens. ALL Camels to go to the hizballahs. Bring them to their knees with sanctions first. The US shoul not negotiate with liars. Break them with danctions, observe if they pull troops out of foregn invasions the Islamic State of Iran is engaged in, see if they stop funding Hezbollah, Hamas, Houtis, etc., and make sure they come on bended knee and weak as kittens to the table ready to dismantle their nuclear program. Just what foreign invasion are you talking about? They are in Syria at the request of the Syrian government. Who invited the Americans into Syria? Who authorised Israel to conduct assassinations in Tehran and other countries? Since the Islamic Republic of Iran received all of that money in cash during the very last week of the Obama Administration, many Iranian civilians were wondering “where is the money” but they figured it out: the regime spent it on military hardware for Hezbollah, Hamas, Syria and Yemen, not for the people of Iran. Some in a crowd were, for the very first time, chanting: “death to the Palestinians” obviously out of frustration for all of that money going elsewhere instead of to them. Hopefully, once the Trump Administration’s full sanctions, including those on Iranian oil exports, go into effect, Iran’s regime may be forced to renegotiate a new deal to replace the “worst deal ever” put in place by left-wing Europeans and our former Secretary of State Herman Munster on behalf of the Obama Administration. If not, then it is likely the Iranian people will take matters into their own hands against their regime. THEY HAVE THE FAGATOLLAH ON HIS KNEES BEGGING FOR A BAILOUT. AFTER ALL THESE PERSIAN FREAKS DONT WANT TO LOSE THEIR LIFE OF PLEASURE WITH WELL-HUNG CAMELS. Well DEBKA, it seems your sources are confused. Just last week other sources had Trump planning a missile strike on Iran so which is it? Not one word of chit chat with the Iranian Islamist scum regime. Unconditional surrender only. Death to all Islamist scum, and their pathetic, spineless dishrag Western apologists and sympathizers. America forever, baby. With the Iranian currency collapsing all the cards are in the hands of the US. The US can choose to negotiate or just sit back and wait for the consequences of a worthless Iranian currency to end the regime. The ripple effect of all this will mean Hezbollah will be looking at the possibility of no money to buy anything or it will take a truck load of Iranian Rials to buy necessary commodities for everyday life.. Time will tell.. Interesting rumor but the desired outcome from the old men in Tehran will not change. The only way Iran moves forward in this word is with a secular government. Trump’s conditions will be black and white with no room for gray. He has the upper hand and the Tussians won’t save the zealots in power. as the rial is inching toward 1 000 000 to U.S. 1$ ! Yep. More posturing and an empty summit followed by a victory lap just before the election. This is all a scam to convince the masses of deplorables who swallow the traitor’s BS by the bucket. North Korea has actually accelerated their nuclear development since the summit but the traitor is turning a blind eye. THE IRANIANS ARE SUFFERING, BUT IT’S THE POPULATION, AND NOT THE RULING CLASSES. THEY HAVE BROUGHT THIS ON THEMSELVES, AND DESTROYED HALF THE MIDDLE EAST IN THE BARGAIN. AMAZING THAT ISRAEL, CONSIDERED AS THEIR ENEMY, IS BEYOND THEIR REACH. IT IS THE GOD OF ISRAEL, WHO PROTECTS US. THE MUSLIMS CAN SAY A MILLION TIMES A DAY, ALLAH HU AKBAR, AND IT WILL NOT SUFFICE. THEY DO NOT BELIEVE IN GOD, AND THE PROOF IS THAT THEY KILL THEIR OWN BROTHERS, ON THE STREETS, AND IN THEIR MOSQUES. HOW CAN ONE KILL ONES BROTHERS IN THE PRAYER HOUSES, AND CALL ON GOD TO HELP THEM. ABSOLUTELY ABSURD. LONG LIVE ISRAEL, TO SHOW THE WORLD THE RIGHT PATH, AND THE PATH TO GOD. Who called it? Next stop. Tea and Crumpets @ the whitehouse.